KIEV, Ukraine -- Western monitors of Ukraine's tattered truce reported Sunday that they had come under fire during an assessment of the situation in the war-torn east of the former Soviet state. 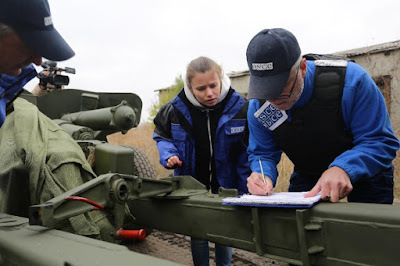 OSCE (Organization for Security and Co-operation in Europe) observers check a column of fifteen MT-12 Rapira 100-mm anti-tank guns being withdrawn by pro-Russian separatists from Donetsk to the village of Zelene, Donetsk region. An Organisation for Security and Cooperation in Europe (OSCE) vehicle was hit with small-arms fire in an area controlled by Ukrainian forces fighting pro-Russian separatists, monitors said on the organisation's website. The incident, which did not cause any casualties, occurred Saturday close to Mariinka, a town some 20 kilometres (12 miles) southwest of de-facto rebel capital Donetsk. Three OSCE observers accompanied by a paramedic and a translator were visiting the area in two armoured vehicles to assess damage to a gas pipeline. About an hour after their arrival, the mission "heard the sound of one or two shots" and saw a hole in the window of one vehicles, the report said. On its Facebook page, the mission condemned the "violent attack against its unarmed civilian monitors". The head of the OSCE monitoring mission, Ertugrul Apakan, described the shooting as "entirely unacceptable". "If monitors are unable to perform their duties, there can be no security and there can be no stabilisation," he said on the OSCE website. He said it followed another incident nine days earlier in rebel-controlled Horlivka where monitors "were removed from their vehicles and forced to the ground at gunpoint". The conflict between government forces and pro-Russian rebels in eastern Ukraine has claimed more than 9,100 lives since April 2014. A new round of negotiations on Wednesday led to a new attempt at a ceasefire, but since then both sides have accused the other of violations.